As I was standing outside my office I just happened to be looking down and some landscaping stones and glanced a stone that was unusual. It appears to have petrified marrow and almost looks like a digit from a toe. 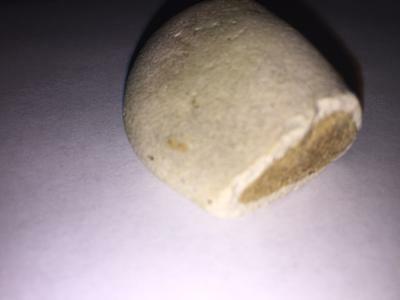 It is about 45mm long, 30mm wide, and about 20mm high. Unlike the other stones surrounding it, it is smooth to the touch except for the portion that appears to be where the marrow is. 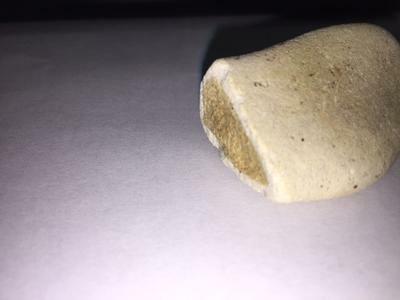 I'm just curious to know if it is a fossil or just some odd looking stone. I would appreciate any input you can provide. Hard to give any definitive information from this photo but there are some things you can do to see if it is bone. Look for cell structure. 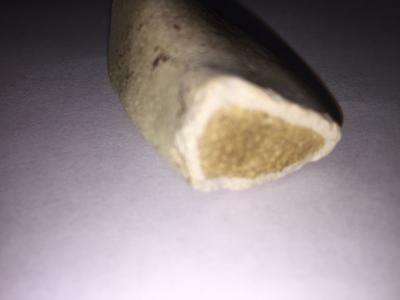 Fossilized bone will have structure to it that resembles bone. It may be porous and you should be able to see cell structure with the naked eye. Another test for bone is to put your tongue on it. most fossilized bone will feel like it is sucking on your tongue. Sound weird but as long as the specimen is reasonably clean it is a pretty reliable test.